A couple of years ago I wrote a series of posts titled "A Political Fantasy", in which I talked about what might be accomplished if political realities weren't what they are and it was possible for governments to simply do what is needed to get us through the coming collapse and energy decline with as little grief as possible. I didn't think back then that many of the things I was suggesting were likely to happen and I still don't. I've been promising to take a look at the other side of this and write about political realities for a while now. In my last post I talked about the likely end points of collapse. The rest of this series will be about how we'll get from here to there. Since politics is going to play a large part in that, this seems like a good time to address the subject. First we'll talk about politics in the western democracies that I and (I suspect)my readers are ost familiar with. If you are a citizen of a western democracy, your view of politics is largely informed by mass media coverage of party politics in your country. This is significant as much for the issues they ignore as for the ones they focus on. If a political position is not supported by any of the mainstream parties and/or the media are not interested in it, then you'll never hear about it unless you do a lot of digging. 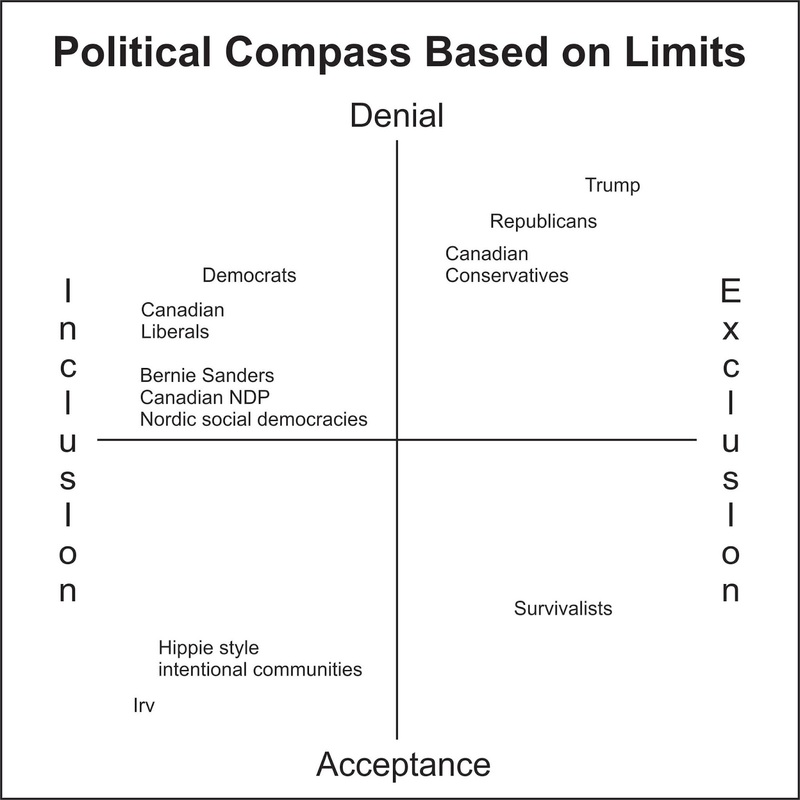 These days, our political options are typically seen to be spread along just a single axis ranging from left to right, which is way too restrictive to represent the nuances of the real world. 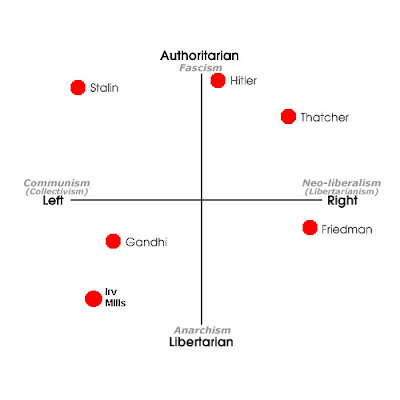 If you go to the Political Compass website, you can take a quiz that will attempt to locate your position along two political axes, left—right and totalitarian—libertarian. This results in a two dimensional map of politics, which is indeed capable of representing more subtleties than a single one dimensional axis. But it is, well, "two dimensional" and it omits some other axes which are also important aspects of modern politics. The left vs. right axis is actually about economics, so we also need to consider a progressive versus conservative axis for social policy. And even economic policy is too complex to be represented on a single axis. In addition to the spectrum that runs from communism to capitalism (left to right), there is also one that runs from fiscally liberal to fiscally conservative (concerning government spending and debt). So, even if we are just talking about "business as usual" politics, I can see at least four dimensions that are significant. No doubt there are more. And having accepted that the limits to growth are real and collapse is a possibility, we can come up with a new political compass using a couple of new axes that are more relevant to those realities. It's vital to do this since, without it such a compass, we'll just spend our time working on symptoms without addressing the real underlying problem—like so many well meaning people today. On one axis I would map the degree of our acceptance or denial of limits. This would run from Limits to Growth folks (like me) on one end to Cornucopians at the other end—people who refuse to admit that we will ever be limited by scarcity at all. On the other axis I would map how we respond to limits when we inevitably run up against them, even if we don't acknowledge their existence. That response might go along several dimensions, but I'd recommend one that looks at a range from social inclusive to socially exclusive. That is, from people at one end of the axis who want to work together towards a mutual solution to people at the other end who want to save themselves and throw everyone else to the wolves. But is all this drawing of charts anything more than just a diverting pastime? I think so, but to understand my take on this we'll need to look at why we should be concerned with politics at all and then why it is vital to consider the limits to growth as part of our politics. Here in North America there is a great deal of apathy toward the subject of politics. I suspect this is also true to at least some extent in Europe. Part of this is because people feel they are unlikely to have any influence in the political process. One vote counts for very little, but I'd counter that by saying that if enough people feel that way, then we are not talking about one vote, but millions. Then there is the problem of finding a political party you can feel good about voting for. This is a problem, but remember—politicians like to be at the head of somebody elses parade. If an issue gains enough public support, the politicians will be eager to take credit for the idea. Some will say that the way our system are set up, politicians are unlikely to fix anything and very likely to make things worse. I agree with that, but we need to do everything we can to minimize the harm they do, if nothing else. Some say that "voting just encourages them". I disagree. They get all the encouragement they need from lobbyists and those who contribute to their campaigns. It's the job of us voters to counteract that, since it is usually a push n the wrong direction. In order to see if we should be adding the limits to growth to our political discussion, we need to know how those limits are and will continue to affect the world we live in. Our current economic, financial and political systems are based on growth fueled by copious quantities of easily accessible and high quality energy resources—primarily fossil fuels. We've been able to have fossil fuels for little more than the cost of digging or pumping them out of the ground. That cost has been very low compared to the worth of the energy they provided. The productivity of the industries fueled by them grew dramatically, compared to industries powered by human or animal muscles alone. This is what is meant by the term "surplus energy"—the excess energy that is available for use once we've done whatever it takes to acquire the energy in the first place. A related term is "energy returned on energy invested", EROEI. In the early twentieth century, when we first started using oil, its EROEI was around 100. But we picked the low hanging "fossil fuel fruit" first and what remains now is either of low quality or more difficult to access, with a much lower EROEI. It is estimated that to maintain a modern industrial society the overall average EROEI must be 15 or greater. The global average EROEI today is around 11.8 and falling. The first effect of a dropping EROEI is the slowing of economic growth. This is a particular problem because of the way our banking and financial systems are set up to accommodate and encourage growth. New money is created via debt—banks lend out money that didn't previously exist and was created by the act of loaning it. Governments, businesses and individuals borrow this money on the assumption that the economy will continue to grow and they will be able to pay it back in better circumstances, with interest. In order for this to happen, of course, others must borrow more money so the interest on the first lot can be paid back along with the principle. And so on, as long as growth continues. When the economy stops growing, this system quits working. Individuals, businesses and even governments go bankrupt, people lose their jobs and so forth. Governments have been diddling growth statistics to make things look better than they are for some time now, but in fact there has been very little real economic growth since the 1990s. Since then apparent growth has been financed by ever-growing debt and the inflation and subsequent bursting of various investment bubbles. Meanwhile we've still been burning fossil fuels and adding carbon dioxide to the atmosphere and climate change is getting to the point where the problems it causes make our other problems that much worse. 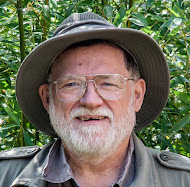 Dennis Meadows, one of the authors of The Limits to Growth, talks about easy problems and hard ones. Easy problems are those where implementing the solution results in immediate and obvious change for the better as soon as you start to implement it. We are good at solving such problems. Hard problems are ones where implementing the solution actually makes things worse for quite a while before they start to get better. Or sometimes things don't get better at all, but the "solution" stops them from getting significantly worse. For the most part, we do a poor job of admitting that such problems even exist. Once they have been identified, we do an even worse job of addressing them. So it seems fair to say that things aren't going well because of the limits we are encountering. We should be doing something about this. There seems to be good reason to believe that a solution which allows us to continue on as usual isn't possible, so we need to start adapting to the new conditions. And you would think governments should have a role to play in that. This is where all these charts of political alternatives comes in—some of those alternatives would likely be much more effective in this situation than others. By knowing what they are, we are in a better position to choose the best of them than if we don't even know what alternatives exist. In my next post I'll have a closer look at what the political alternatives are, and how well each of them is adapted to the challenges we face. 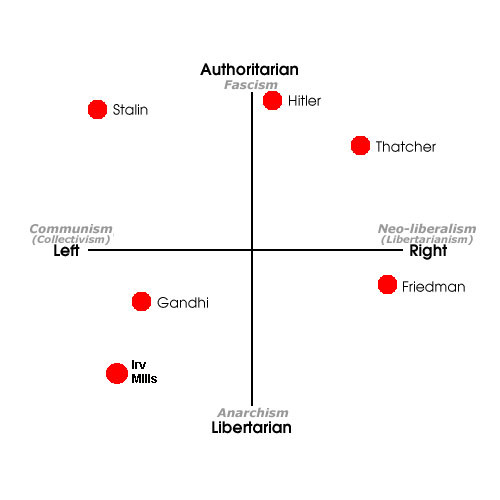 I like your alternative political compass. We desperately need to move towards the acceptance direction and work out some coping and adaptive solutions real soon. Philip, nice to hear from you. I've read something very similar to what's on the Moral Theory website before, but I notice they are suggesting a sixth foundation: liberty/oppression. I'm all for that. It is amazing how seemingly minor differences in emphasis on those six foundations can lead to very different outlooks. But I would hope that understanding what those differences are might lead to a little more appreciation of that other guys position. Bev, nice to hear form you again. I'm fairly pleased with that new compass. A wider acceptance of the reality of limits would be a major step forward, indeed. Watching events in the U.S. (which isn't that far form here) makes me thinks that inclusiveness is also pretty important, and that exclusiveness is going to have some very destructive fallout.